If you would like to order copies of our safety packs, brochures or stickers, complete the form below and copies will be sent to you. How would you like us to contact you Note: If your contact preference is by email, we still require a day time phone number. This number will only be used when we are required to confirm details. Pack - Agriculture industry (max 5 copies) Contains Look Up and Live folder, Agriculture industry brochure, Marking Powerlines brochure, Exclusion Zones sticker, What to do if your tractor brings down powerlines sticker and the Exclusion Zone low tac windscreen sticker. See example Agriculture industry pack (PDF). Pack - Aviation industry (max 5 copies) Contains Look Up and Live folder, Low Level Flying brochure, Marking Powerlines brochure. See example Aviation industry pack (PDF). Pack - Building and Construction industry (max 5 copies) Contains Look Up and Live folder, Building and Construction Industry brochure, Plumbing Industry brochure, Building, Structures and Billboards brochure, Exclusion Zones sticker, What to do if your excavator brings down powerlines sticker and the Exclusion Zone low tac windscreen sticker. See example Building and Construction industry pack (PDF). Pack - Cane industry (max 5 copies) Contains Look Up and Live folder, Cane Industry brochure, Marking Powerlines brochure, Exclusion Zones sticker, What to do if your harvester brings down powerlines sticker and the Exclusion Zone low tac windscreen sticker. See example Cane industry pack (PDF). Pack - Cotton industry (max 5 copies) Contains Look Up and Live folder, Cotton Industry brochure, Marking Powerlines brochure, Exclusion Zones sticker, What to do if your tractor brings down powerlines sticker and the Exclusion Zone low tac windscreen sticker. See example Cotton industry pack (PDF). Pack - Trucking industry (max 5 copies) Contains Look Up and Live folder, Trucking Industry brochure, Exclusion Zones sticker, What to do if your truck brings down powerlines sticker and the Exclusion Zone low tac windscreen sticker. See example Trucking industry pack (PDF). Factsheet - Working safely with electricity around agricultural netting and structures (max 20 copies) See example Factsheet (PDF). Sign - Exclusion Zones Coreflute (max 5 copies) For use on farms and worksites, can be attached to fencing or pickets. See example Coreflute sign (PDF). Sign - Delineator Cover Witches hat cover (cone shaped) for use on farms and worksites. See example Deliniator cover (JPEG). Sticker - Exclusion Zones - Large (max 20 copies) Size 210mm x 100mm. Suitable for visors in vehicles. See example Exclusion Zones large sticker (PDF). Sticker - Exclusion Zones - Small (max 20 copies) Size 50mm x 100mm. Suitable for phones, note book covers, etc. See example Exclusion Zones small sticker (PDF). Sticker - Exclusion Zones - Low tac for windscreens (max 20 copies) Size 100mm x 140mm. 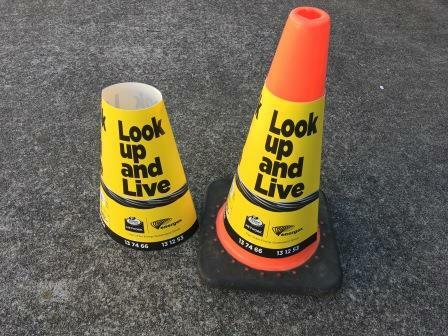 For use on windscreens, allows for height of vehicle to be noted. See example Exclusion Zones low tac sticker (PDF). Sticker - Exclusion Zones - Truck A4 reflective (max 20 copies) For use on truck trailers to alert drivers to look out for overhead powerlines before climbing aloft. See example Exclusion Zones Truck reflective sticker (PDF). Sticker - Exclusion Zones - Cane Industry low tac (max 20 copies) For use on windscreens. See example Exclusion Zones Cane Industry low tac sticker (PDF). Sticker - What to do if your vehicle brings down powerlines (max 20 copies) Size 210mm x 100mm. See example sticker (PDF). Swing tag - Grain auger safe operating height Size 80mm x 150mm. See example Look up and live auger swing tag (PDF).